Have you heard of sugar hari removal ? The wax hair removal kit with sugaring paste is a complete waxing set for successful hair removal and promises up to 4 weeks of softness. It contains a pot of sugar wax, a spatula and 10 strips of cotton for easy and easy use. The wax is 100% natural and effective on the body and the face. Organic wax is suitable for all types of skin, even the most sensitive. Enriched with moisturizing glycerin and protective sugar, the natural and organic formula of Fluid Sugar wax does not harm the skin. With hair removal properties uncontested for millennia, sugar makes hair removal more pleasant and leaves the skin soft. No more epilations that irritate and painful. The use of sugar wax is not recommended for hair less than 5 mm for optimal hair removal. - Start by heating in the microwave or bain-marie the pot of wax with fluid sugar. - Using the spatula, apply directly to the desired area in thin layers. - Be careful, your skin must be clean and dry. With the tip of the spatula, slide the sugar wax in the direction of the hair growth. - Wait a moment for the wax to cool. 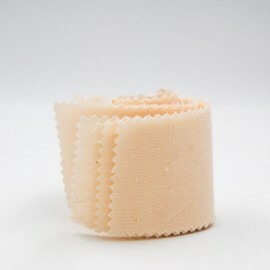 Position the cotton band over the wax by smoothing firmly with the palm of your hand. - Remove the tape in the opposite direction of hair growth. - Once waxing is done, the wax residue will disappear with water. The strips (reusable 3 times) and the spatula can also be rinsed with warm water. Fluid Sugar Wax can be used on the face, armpits, arms, bikini, legs, thighs, back or torso. Good to know: it is advisable not to scrub the day of hair removal and not take a shower just before waxing. Its formula enriched with moisturizing glycerin and protective sugar helps to ensure gentle and non-aggressive hair removal of the epidermis. A 100% natural hair removal kit for effective skin protection that respects the most sensitive venous systems. Deo Alun Stick is an ergonomic and hygienic deodorant 100% natural alum stone that guarantees effective protection throughout the day. Thanks to its astringent and antibacterial properties, it regulates the flow of perspiration without blocking it while fighting against bad odors. Deo Alum Stick is suitable for all skin types, even the most sensitive ones.